Rose Community Foundation helps Jewish Institutions such as Congregation Beth Evergreen grow stronger through initiatives like MazelTot.org, which connects young families to Jewish life. This Evergreen synagogue is among dozens of Jewish institutions in Greater Denver and Boulder benefiting from our grants and programs that are designed to help them build strength and stability as well as increase Jewish engagement. Mousseau points to the synagogue’s growing number of young families as one of its greatest successes. That growth has been possible thanks to a Rose Community Foundation grant to engage new families, plus the synagogue’s participation in MazelTot.org: Connecting Young Families to Jewish Life. 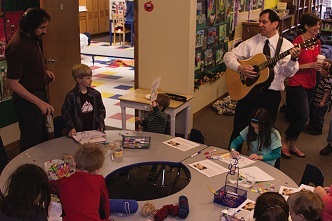 Congregation Beth Evergreen’s opportunities for young families and children – such as their Tot/Family Class – are highlighted on MazelTot.org making it easy for parents to connect with Jewish experiences. Beth Evergreen has also tapped Rose Community Foundation support and expertise to build successful planned giving and endowment programs through The Endowment Challenge and Live On: Build Your Jewish Legacy initiatives. Their endowment fund, managed by Rose Community Foundation, has provided an annual distribution to the synagogue for the last 11 years, reducing their fundraising burden year after year. Nearly 15% of the congregation members have made a legacy gift to help sustain the synagogue’s long-term future – a total estimated value of more than $1 million from 55 gifts. These legacy gifts will eventually increase the endowment fund and hopefully lead to sustainability in the future. Learn more about endowments at rcfdenver.org/endowments. Learn more about the Live On initiative at liveonlegacy.org. See what Congregation Beth Evergreen has to offer at bethevergreen.org.